When it comes to Mother's Day, Emily Thompson knows how to send the right message of love and gratitude in the language of flowers. Thompson, whose floral shop in Manhattan is named after her, hails from Vermont but now lives in New York City. Thompson, whose shop features many U.S.-grown materials from New Jersey and California, said she feels very strongly about supporting U.S. farmers. And she's noticed that her customers were starting to think more locally as well. "There's a beginning of a movement that relates a lot to the movement that's happened with food," she said. "They're looking for something that evokes the season and evokes the landscape right outside their door." Thompson said she'd also seen an increase in the number of people interested in growing their own flowers. All of the flowers in her shop are not grown in the U.S., she said, but the U.S. growers she uses include Green Valley Floral in Salinas, California, as well as New Jersey's Hautau & Sons. In addition to its 80 rose varieties, Green Valley grows 20 varieties of lilies and 80-plus varieties of gerberas. The farm has been in the flower business for more than 45 years and employs 45 full-time workers. Hautau & Sons, a family-run business, produces ranunculus year-round. During peak season, it employs 10-12 workers. While Thompson said that some U.S.-grown flowers can be more expensive, she said locally grown flowers usually last very well because they do not withstand a long travel time. 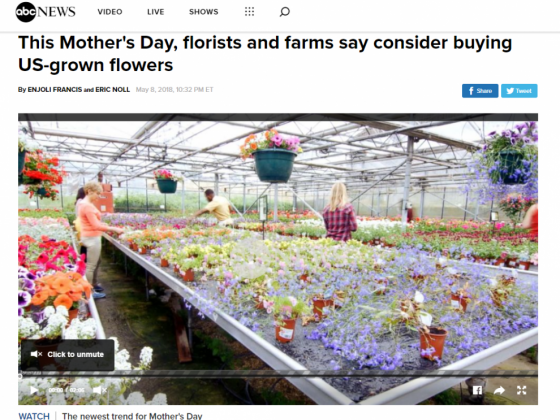 She also said that in addition to reducing the carbon footprint, buying U.S.-grown flowers promotes a culture that values flowers in general and a culture that is engaged with the flowers from seed to vase. The options to buy U.S.-grown flowers are growing. Slow Flowers, run by Debra Prinzing, is a nationwide online directory for florists to find U.S.-grown flowers. Click here to find florists in your community who sell flowers grown in the US. Pot and Box in Detroit uses the Slow Flowers network to connect with U.S. farms and the florist also showcases its floral arrangements in Detroit-made vases. In Chicago, Field and Florist is located in the Wicker Park neighborhood and also uses the Slow Flowers network to supply more than 40 Chicago-area florists with flowers. Thompson, a former artist who said her love for flowers had "crept up" on her, said she was now focused on not only supporting her beloved blooms, but also giving U.S. farmers a voice and connecting her clientele with the "living world." "We're bringing customers' seasonality and their landscape home with them," she said.